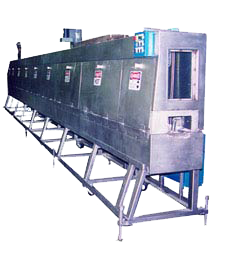 Liquid cascade curing systems flow salt over the top of the product enabling the product to affectively see liquid salt contacting the full surface with minimal pressure to the product. This system is particularly effective at curing sponge or automotive profiles will very little distortion and having no belt marks which may be of concern with hot air cured systems. Manual roller systems are used in conjunction or stand alone on many systems that are small dense rubber profiles. 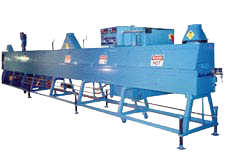 These systems consist of small free turning rollers that are mounted to racks. The racks are manually lowered and rollers push the product under the salt for curing. The racks are counterbalanced so they can be positioned to properly submerge the product to the depth desired. 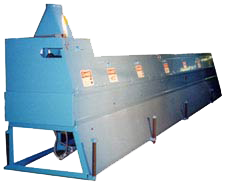 Powered roller systems are used for slightly larger products and are affective at submersing the product and assisting the product through the curing media. Since the rollers are powered there is no drag on the profile. The height can be adjusted to properly submerge the product to the depth desired. 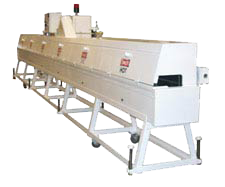 Belt immersion systems offer similar use as the powered roller systems but provide constant contact with the product the full length of the curing system. A combination of the cascade system with any of the other above systems is particularly useful. The cascade can provide the initial cure and set the surface to the profile and the immersion system selected can provide total product immersion for maximum curing capability. Most LCM tanks are hot rolled steel as the salt does not necessarily pose a corrosion problem. We have hot rolled tanks in service now for over 30 years. Stainless steel systems are also provided where the customer prefers SS or there may be a special need, such as systems used for medical products.